The year is 2043. A skyscraper-tall rocket sits atop a launchpad. The engines ignite with a roar. The rocket lurches upward, climbing higher and higher until it leaves Earth’s atmosphere. In space, the nose of the rocket breaks open and releases its payload. It’s the most powerful space telescope in history, built by NASA to photograph Earth-like exoplanets orbiting stars like our own. The technology is so advanced that the telescope can detect shapes of oceans, clusters of vegetation, and peaks of volcanoes. The telescope unfurls its mirrors. Its name is emblazoned in large, silvery letters across its side: the Budweiser Space Telescope. Or the Doritos Space Telescope. Or the Amazon, or Snapchat, or Comcast Space Telescope. Go ahead and giggle. But this is the potential future of NASA’s exploration efforts, if an idea from the agency’s leader comes to fruition. NASA administrator Jim Bridenstine said at a recent meeting that he would convene a committee to explore whether NASA could make some extra cash by selling naming rights to rockets and spacecraft. “I’m telling you there is interest in that right now,” Bridenstine said. “The question is: Is it possible? The answer is: I don’t know, but we want somebody to give us advice on whether it is. A NASA spokesperson told me on Tuesday that Bridenstine hasn’t yet appointed members to this committee that hasn’t been set up yet. A NASA economic adviser pointed me to a study from last year, by the Science and Technology Policy Institute, a federally funded research center. The study found that corporations like Citigroup, Barclays, Metlife, and AT&T pay about $20 million annually to maintain naming rights for sports stadiums across the country. Perhaps a corporation may want to do the same for the International Space Station. There’s certainly a market for this idea, and has been for decades. In 1966, Tang, the orange-flavor powdered drink, ran commercials showing astronauts pouring the mix into a “zero-G pouch” during a Gemini flight. More recently, Red Bull sponsored a skydiver’s jump from the stratosphere in 2012, and KFC paid a company to send a chicken sandwich to the edge of space last year. Space clearly sells. But NASA shouldn’t be on the market. As a government agency, NASA has spent its nearly 60-year existence avoiding endorsing any brands. Unlike their Russian counterparts—who have filmed commercials for Pizza Hut, RadioShack, and an Israeli brand of milk while in space—American astronauts go to considerable lengths to avoid the appearance of promoting or engaging in commercial activities. In 1985, NASA agreed to bring modified cans of Coca Cola and Pepsi on board a Space Shuttle flight, but officials stressed the purpose was not to conduct a taste test, but to study the effects of microgravity on the containers. “NASA says other soft-drink companies are welcome to devise containers for shuttle testing,” a New York Times article from the time said. 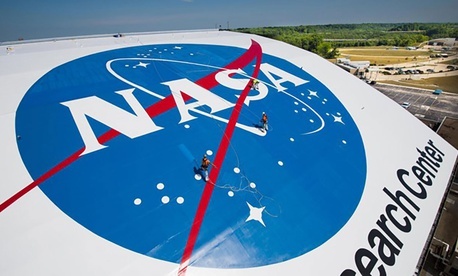 NASA doesn’t charge fees or require licenses from companies and other entities that want to use its logo. It even goes so far as describing M&Ms, which astronauts can have on the International Space Station, as “candy-coated chocolates,” as Christian Davenport points out at The Washington Post. The space agency doesn’t want to appear to favor one thing over another. Space, its mission says, is for everyone. Bridenstine’s proposal would set a dangerous precedent for NASA’s future. By suggesting that commercial partnerships could help fund NASA’s missions, it implies that the agency is not worth funding through the usual means—annual budgets carefully negotiated and ironed out by lawmakers. And their constituents believe that the space program is important; according to a studyfrom the Pew Research Center in June, 72 percent of Americans say it’s essential for the United States to continue to be a world leader in space exploration. If Nike is ready and willing to drop millions of dollars to sponsor the next mission to Mars, why should lawmakers bother spending any taxpayer money on it? The world’s premier space agency shouldn’t have to resort to brand sponsorships in the absence of political will. And even if brands could float the first few years of a mission, they might not have the stomach for the years, or even decades it sometimes takes for NASA’s most ambitious missions to come to fruition. In the last decade, more and more commercial companies have gotten into the spaceflight game. NASA is currently working with (and paying) SpaceX and Boeing to develop transportations systems that will deliver future American astronauts to and from the International Space Station. But to allow commercial companies to bid for naming rights on NASA missions seems like a step too far. It undermines the gravitas of the efforts undertaken not for the benefit of one brand, but for the whole of humanity. The names of historic NASA missions became embedded in American culture as symbols of tremendous ambition and scientific curiosity. Apollo, Voyager, Hubble, Cassini—these resonate in a way a brand name won’t. Future missions will take their place among them, and NASA would do well not to grant their namesakes to the highest bidder. When I heard that Bridenstine would consider selling NASA naming rights to corporations, I thought immediately of Eugene Parker. Parker is an American astrophysicist and the first person to write about an important property of our sun, known as the solar wind. The sun, he said, is constantly unleashing streams of charged particles that reach across the solar system, all the way to its very edges. No one believed Parker when he first wrote about this wind. “It was something most people couldn’t seem to swallow,” he told Air & Spacemagazine recently. But in time, proof appeared. Parker was vindicated. Last year, NASA announced it would name its next mission to the sun after Parker. The probe launched last month, 60 years after Parker first made his discovery. He’d just turned 91. If anyone deserves naming rights to NASA missions, it’s people like Parker.